We have recently designed a brand new web site for St Louis based Aeterna Medical Spa. 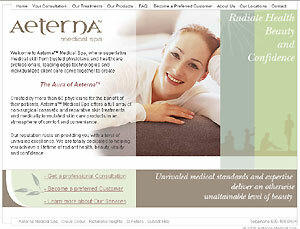 Aeterna Medical Spa is in the business of “attainable beauty” and required a web site which portrayed just that. Delivering information on their new venture and providing incentives on becoming a preferred customer were other important aspects of the site. We also provided a content management system so the client could create their own promotional pages.